Although its value may not have been apparent to all at the outset, AngelList has proven to be a remarkably effective way for investors to connect with entrepreneurs. The hybrid social network, communication and crowdsourcing platform offers a greater degree of visibility to startups that might not have access to investors, and, on the flip side, has become an important resource for investors looking to boost dealflow and connect with other investors. AngelList is looking to level the playing field, and harness the power of the crowdsourcing models to connect great ideas to the capital that can get them off the ground. But some have worried that the crowdsourcing model will encourage the herd mentality, and, with scale, potentially end up with an unfavorable ratio of noise to signal. AngelList facilitates a growing number of investor-founder introductions, but it’s always in need of better ways for all parties to dive down and see what’s happening at various stages of the funding process, both to help inform decisions down the road and get a better sense of the landscape in the present. Today, AngelList added some cool new features to its homepage (sign out if you’re logged in), which offers the startup a more effective way to show off what it’s been able to accomplish and gives all visitors a better way to break down the information they want to see. It’s also released funding statistics on its startup flock with a new landing page called “Done Deals.” Currently, the new page is showing that 978 startups have found some form of investment since 2010, along with offering investors and startups the ability to sort through these deals by type, by the year they closed, the amount, and even search for participating investors. It’s a great use for the unique data the platform has collected over the past two years, and provides some much-needed context. 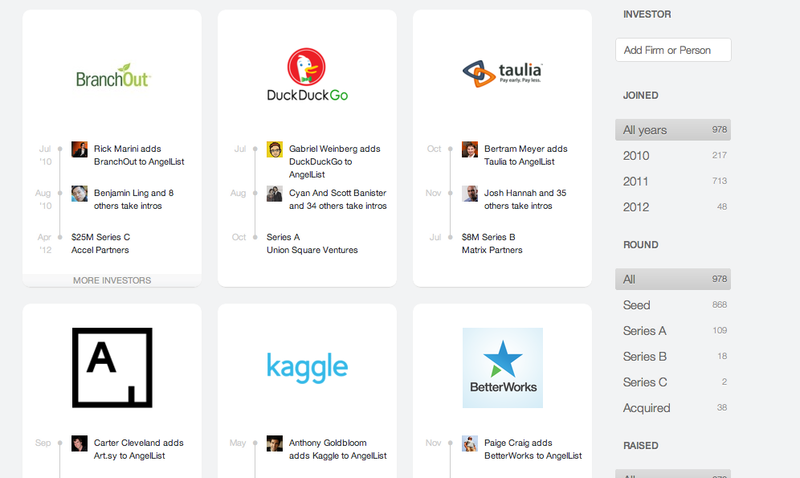 The stats show that nearly 40 startups on AngelList have been acquired since 2010, two have raised series C rounds, 18 series B, 109 series A, and 868 have now raised seed capital.